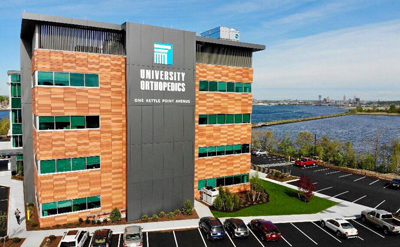 University Orthopedics - Healers, Innovators, Teachers. When a person experiences pain from a lower extremity problem — such as pain in a foot, or ankle — it can be excruciating to stand or walk. Even common problems such as a bunion, ingrown toenail, callus or improper shoe fit can prevent you from walking without pain. For those who make a living in sports that involve repetitive twisting, stopping, starting and jumping, pain in a foot, ankle or knee can spell the end of a sports career, as it will stop you dead in your tracks. Many lower extremity problems stem from injury during activity. Ankle or foot fractures and tendon injuries are common with basketball, soccer, football and any sport that involves landing on the feet or side impact. The Division of Ankle and Foot Surgery focuses on deformity, trauma, and disease of the foot and ankle. This busy service provides much of the foot and ankle care for Southern New England and oversees daily management of many pathologies which affect foot and ankle functions, such as bunion and lesser toe deformity correction, fracture repair, total joint replacement and fusion for arthritic maladies, arthroscopic management of sports injuries, complex reconstruction of lower extremity malalignment, and care for diabetic/neuromuscular disorders. Conservative and surgical approaches encompass both basic treatment methods and more unusual state-of-the-art technological advances, taking place at both The Rhode Island and Miriam Hospitals. This burgeoning Division also represents the primary educational foot and ankle program for Brown Medical School. It strongly espouses the principles of the American Orthopaedic Foot and Ankle Society (AOFAS) to deliver top quality care to foot and ankle patients, and is responsible for teaching medical students, residents, and visiting orthopaedic surgeons the skills to ensure competent evaluation and treatment of the spectrum of lower extremity disorders they will encounter. Cases are discussed weekly with The Chief of Service, who coordinates the Division’s teaching, research, and clinical care in the subspecialty of foot and ankle. Guest lecturers with similar expertise are sometimes invited as orators to share their experiences and, occasionally regional conferences are held with other academic foot and ankle orthopaedic surgeons at neighboring major New England hospitals to strengthen the educational and supportive relationship enjoyed between members of the AOFAS.